Yifan Cao, who recently graduated with an MSc Business Analytics, rounded off her Masters with an award-winning dissertation project. She won first prize in the Consumer Data Research Centre (CDRC) Masters Research Dissertation Programme, for her dissertation entitled “An Application of Multinominal Logit Modelling in E-fulfilment Demand Management”, which was sponsored by Sainsbury’s. The CDRC is funded by the Economic and Social Research Council (ESRC) and consists of researchers at Leeds, UCL, Liverpool and Oxford. The Master Research Dissertation Programme links retailers with students nationally who conduct analytic research on retail data. This year, Yifan competed against 17 other projects to scoop the top prize, and a description of her work will be featured in a future issue of the Operational Research Society's Impact magazine. Yifan conducted an empirical study using online grocery sales data from Sainsbury’s to model customer choice behaviour in the context of delivery time slot selection. Specifically, she devised and estimated the parameters of a nested choice model that first considers the choice of the day of delivery, followed by choice of the time slot within a given day. The choice model has been validated using some holdout sample data and has been found to predict slot choice behaviour very well. The output of this work can be used, for example, to improve the efficiency of home delivery logistics. 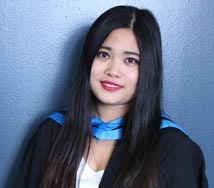 Yifan conducted her research as part of her MSc Business Analytics, which teaches students how to gain insights from large data sets through the use of statistical methods, optimisation techniques and predictive models, and apply these to business problems. Arne Strauss, Course Director of MSc Business Analytics, and Yifan’s Dissertation supervisor, said: “Yifan produced excellent work on a challenging topic; the estimation of a choice model as complex as this is not trivial. She overcame major technical obstacles, and provided the retailer with valuable insights. Warwick Business School’s MSc Business Analytics course has been ranked seventh in the world in a new QS World University Ranking.